The Michigan Stars FC (MCFC) has announced that it will return to National Premiere Soccer League (NPSL) competition for the 2019 season where the team will be competing in the NPSL Great Lakes Region. The Michigan Stars FC joined the NPSL for the 2014 season competing in what was then called the Midwest Region. After four seasons in a very competitive division, team management made the decision to sit out the 2018 season and focus on rebuilding the operation and return with a competitive team in 2019. The revitalized 2019 Stars will be led by Head Coach George Juncaj. Juncai emigrated from Montenegro in the early 1980’s and played professionally for the San Pedro Croation Club where he was the top scorer in the Pacific Coast League 1987 season. Juncai formed the Detroit United in 2002 earning several top honors including a second-place finish in the 2010 U.S. Open Cup. He is well-known throughout the soccer community with clubs like SBV Vitesse (Holland), Grasshopper FC Zurich (Switzerland) and IMG Academy (United States). 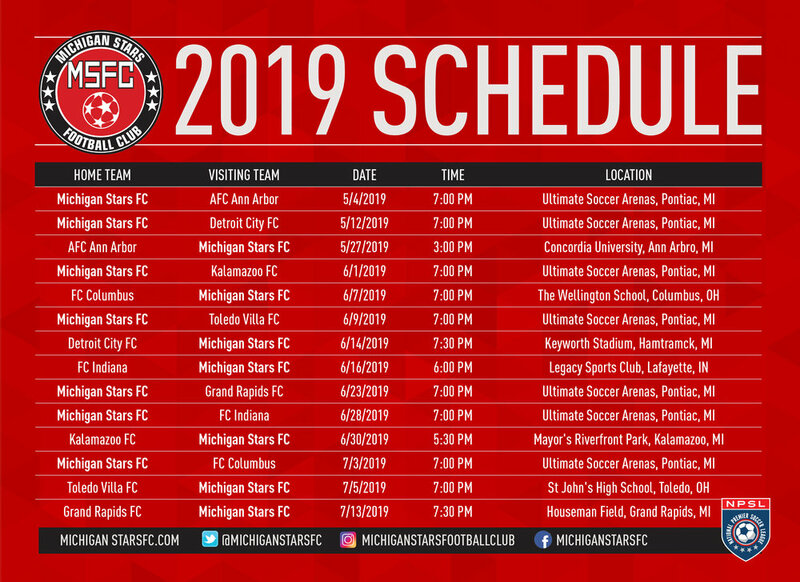 The 2019 Michigan Stars FC will compete in the NPSL Great Lakes Conference that also includes AFC Ann Arbor, Detroit City FC, FC Columbus, FC Indiana, Grand Rapids FC, Kalamazoo FC and newcomer Toledo Villa FC. MSFC will play their home games at Ultimate Soccer Arenas, 867 S Blvd. E, Pontiac, MI. The home opener is scheduled for Friday, May 4, 2019 at 7:00 PM. Tickets for all home games will be available for purchase at www.michiganstarsfc.com. For updates on the team follow us on Twitter @MichigansStarsFC, on Facebook, /michiganstarsfc and on the web at www.michiganstarsfc.com.